This serenely comfortable home and tranquil setting will melt your cares away. Soak in the hot tub, enjoy the gardens, swim in the pool, or read a book by the fireplace. This is a classic Monterey Post/Adobe style house that has been fully remodeled and exquisitely furnished. There are many inviting outdoor nooks to discover here. Walk to Carmel Valley Village and taste wine at one of the many tasting rooms or dine at a choice of international restaurants. Perfect for families, personal, group, and executive retreats, or small quiet seminars and workshops. In this park-like setting, you can hear the sounds of birds and the gentle breeze rippling through the pine trees, see an occasional hawk circling over the property, or revel in watching the pool reflections on the living room ceiling. The back terrace, accessible through French doors from the dining room area, has a table with umbrella and chairs surrounded by a raised terraced garden. Each of the five bedrooms has night tables with reading lamps and pretty bedspreads. Fully-equipped and very roomy kitchen. Gas cook top, single gas oven, water filter, microwave, full set of utensils and cooking accessories, coffee maker, toaster oven, phone, breakfast nook (not in picture) with pool view, and skylight. Natural, pond-like full-size swimming pool with solar heat. Pool is swim-able from approximately May through most of October. Hot tub behind bamboo provides serene privacy. Surrounded by pine, maple, willow, and fruit trees full of birds, an occasional deer, and other wildlife. We lived in this wonderful home from 1976 until 1986. During that time we fully remodeled this wonderful classic Carmel Valley post adobe home. In 1999 we completely furnished the home and set it up as a vacation rental so we could spend time there ourselves as well as let others enjoy the peace and tranquility it offers. It is our art piece and escape. Everyone who has stayed there loves it and we now have many yearly returning families and groups. 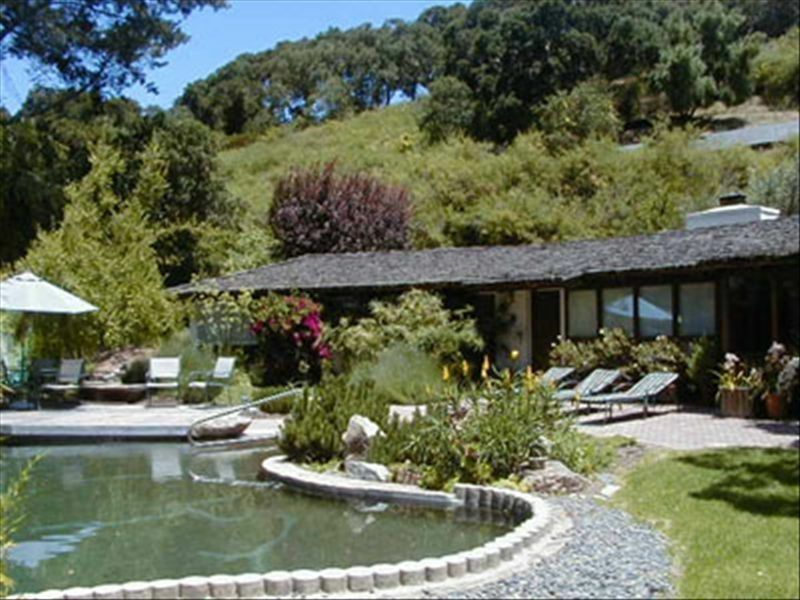 Carmel Valley Retreat was the home we lived in for over 10 years. Carmel Valley offers some of the best weather in the world. Over 300 sunny days a year and almost none of the fog that covers Carmel and Monterey all summer long. The beach in Carmel is 12 miles away. Bernardus Lodge & Spa is about one mile away. Carmel Valley Village is walking distance about 1/10 mile. There are countless wine tasting rooms and at least nine resturants plus shops. Views of Garland Park and Los Padres National Forest. Beautiful pond like pool in the front yard. Room for five cars in driveway. Please always park in driveway. Electric and French press and grinder. generous space with all pots, pans, utensils and spices. Gas stove and a single electric oven. Coffee maker plus French press. Breakfast nook with view. Filtered water. Large table in dining room seats 10. Large drawer of games in dining room. Terraced gardens, fish/frog pond with waterfall. Deck around pool with large table with umbrella. Back patio with table, terraced gardens. View decks up on hill. Single story. Main house has one step up in front and level at back French doors. Beautiful free-form one of a kind pool with sloping entry and natural cement finish. Solar heated from mid-May until mid-October. Twice per week cleaning service. Great property, great location. Owner was very nice to work with. House was perfect for our weekend of cycling. It was wonderful to wake up to the sound of water in the pond. The children enjoyed exploring the yard with all its imaginative touches. As we are three generations, the two bedroom wings was very suitable. And the well equipped kitchen was especially nice. Beautiful home for our family gathering and in a great location for day trips. The home met all of our needs and more. Chuck was very responsive to our questions and super to work with! He was able accomodate our last minute request to arrive a day early to avoid the smoke in San Francisco. He also provided us with the current status in Carmel Valley and really set our mind at ease. We were blessed with great weather and a super time celebrating Thanksgiving with family. This is a lovely, spacious, and peaceful property with everything you would ever want! Three generations of family members were able to enjoy the pool, hot tub, deck, flower gardens, hummingbirds, etc. very comfortably in a perfect location! This is a perfect getaway, a serene oasis. Very well appointed, tasteful and artful décor, comfortable both indoors and out. A warm spirit permeates the home! Countless wine tasting rooms in Carmel Valley Village plus great resturants. Hiking close by at Garland Park. 25 minute drive to the Monterey Bay Aquarium. one hour drive to Big Sur. This site does not allow us to fully describe our rates. House only (max 6 people) is available in Low Season $1,650 for three nights and $3,605 per week + 10.5% tax. Please contact us for a precise quote. Thanksgiving & Christmas are at High Season rates. There is an un-fenced pool and small pond in the front yard. Children under 7 years old require an Indemnity Waiver be signed.